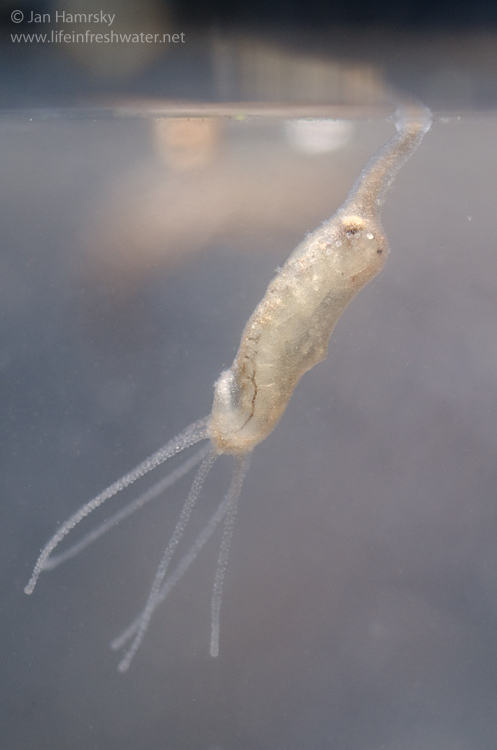 Predatory hydra feed on insect larvae and, especially, small crustaceans, such as water fleas, seed shrimps and copepods. However, any small animal up to the size of the hydra may be engulfed. 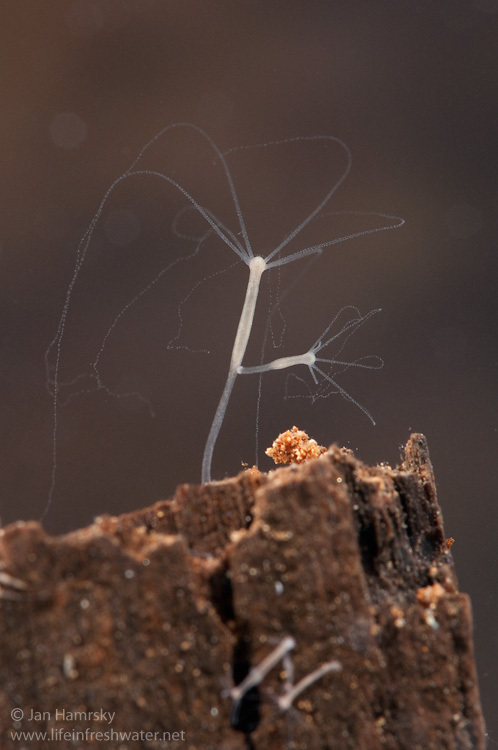 Hydra can be found in large variety of freshwater habitats. They mostly occur in ponds, lakes, and slow flowing parts of streams and rivers. 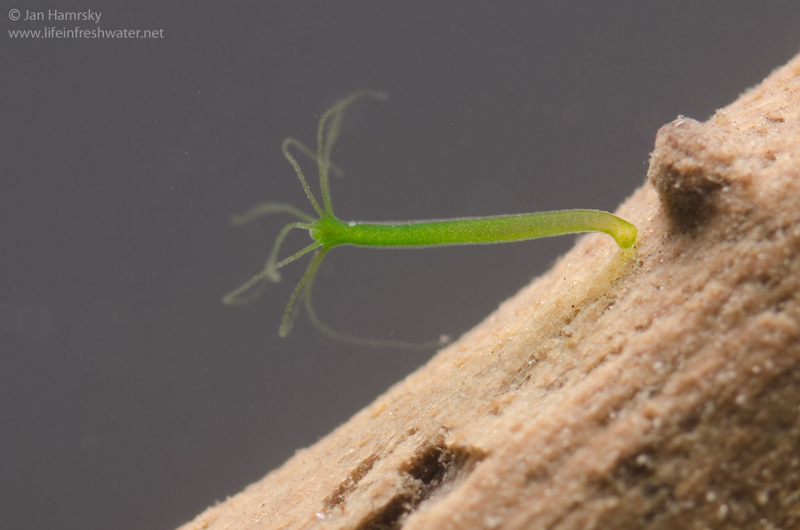 Hydra are sessile and live attached to aquatic vegetation, submerged wood, or stones. 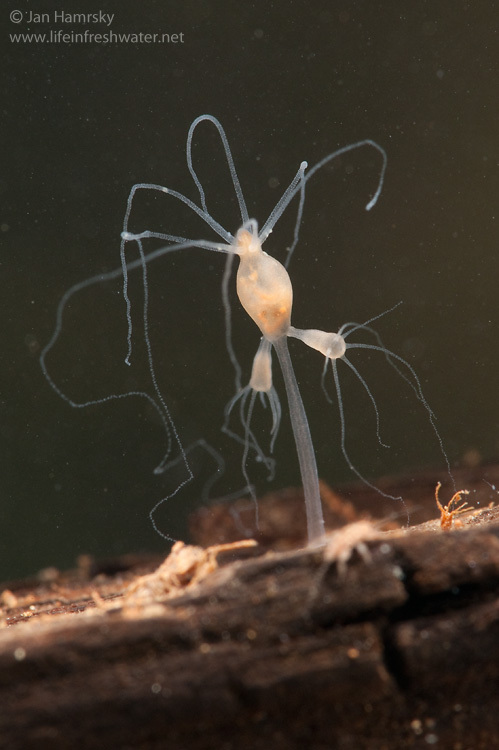 Hydra remain stationary for long periods, although they may move by bending the body, attaching with the tentacles, releasing the basal disc, and re-attaching. 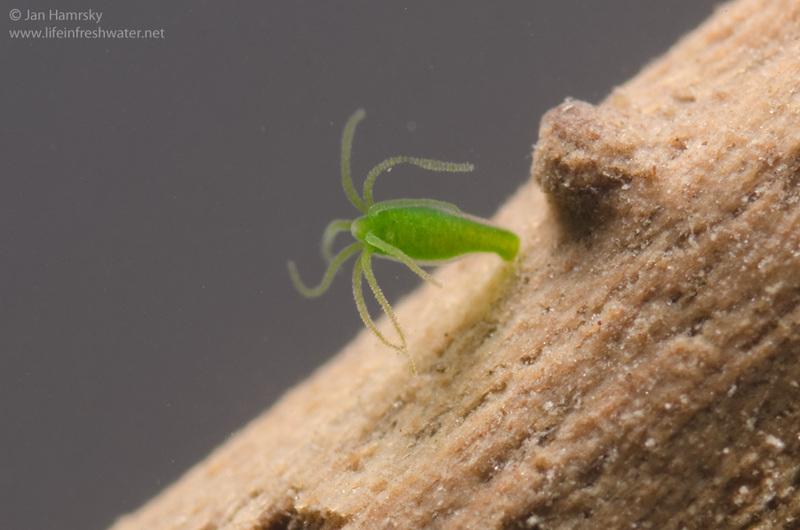 Most species of hydra are less than 15 mm long (not including the tentacles). 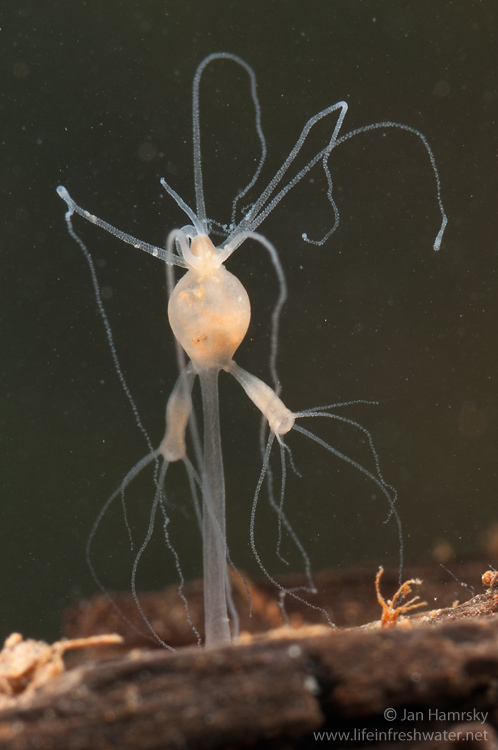 Cnidarians alternate between the polyp and medusa life forms. 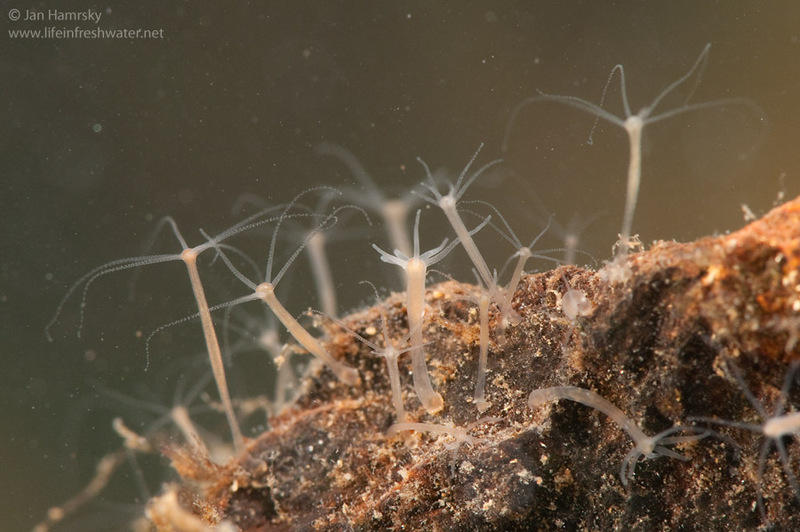 In hydra, the medusa stage is absent and polyps reproduce both sexually and asexually. Hydra are exceptionally interesting due to their regenerative ability and that they appear not to age or die of old age. However, they can still die from means other than aging (senescence), such as through injury, disease, starvation, or unsuitable conditions in the habitat. 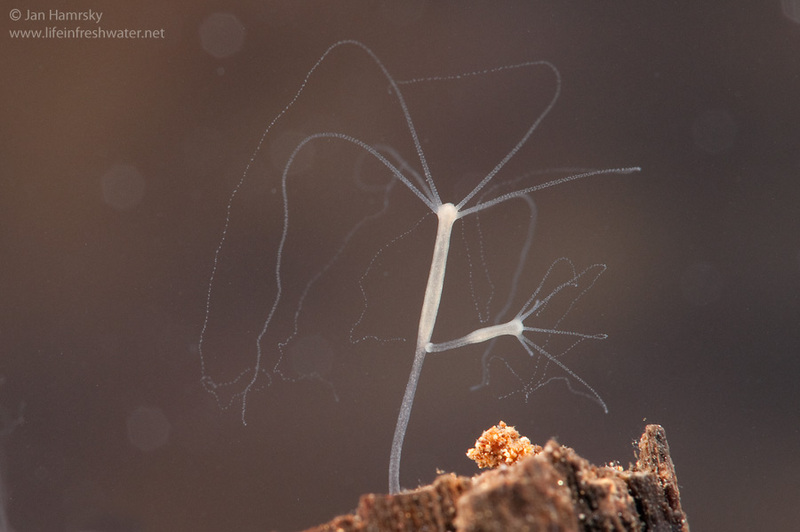 Hydra are inconspicuous freshwater relatives of corals, sea anemones and jellyfish. 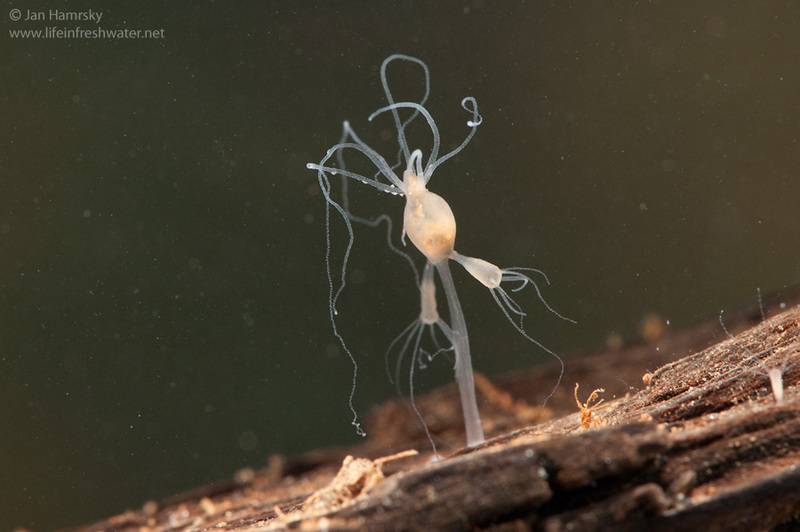 All are members of the phylum Cnidaria, characterized by radially symmetrical bodies, presence of stinging tentacles and a simple gut with only one opening (gastrovascular cavity). The body is a hollow tube consisting of two layers of cells, separated by an unstructured gelatinous layer (mesoglea). The inner layer (endoderm), lining the gastrovascular cavity, produces the enzymes for digesting food. The outer layer of cells (ectoderm) generates the tiny stinging organelles called nematocysts. Tentacles are extensions of the body layers and circle the mouth opening. Due to simple construction, body column and tentacles are highly extensible. 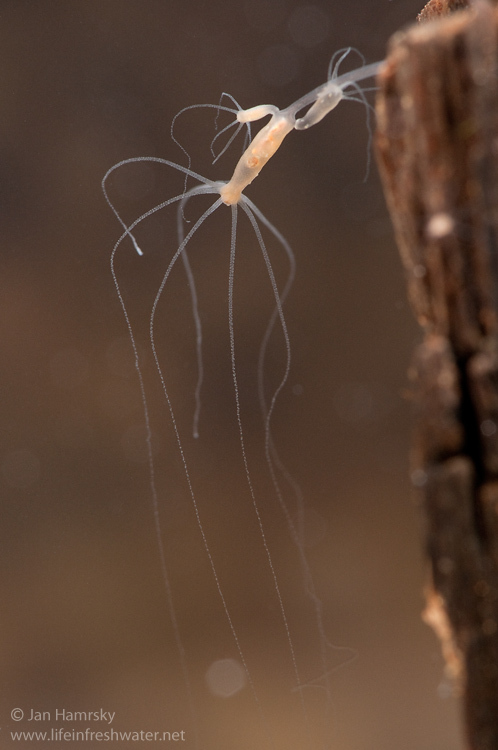 When hunting, hydra spread the tentacles, move them slowly around and wait for a contact with some suitable prey. 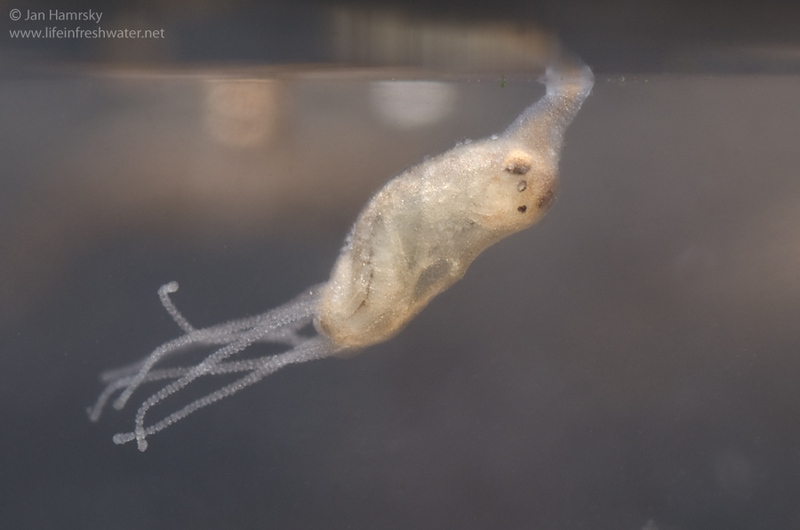 Small animals, which come across the tentacles, are paralyzed by neurotoxins released from the stinging nematocysts. Tentacles coil around the struggling prey and drag it into expanded mouth opening. When the victim is enclosed within the body cavity, digestion may starts. Cuticles and other undigested remains are later expelled by contractions through the mouth. 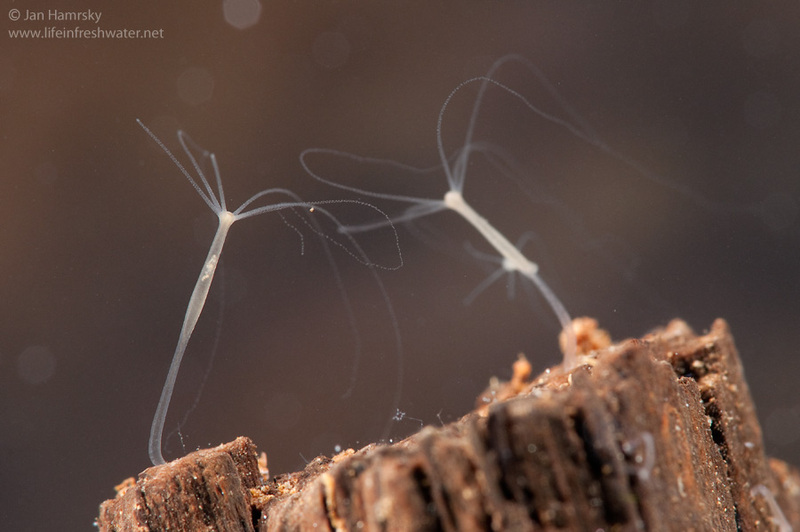 Hydra mostly reproduce asexually by producing buds on the body wall. Buds are genetically identical clones, which grow and simply break free when they are mature. 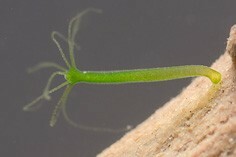 Hydra may possess several buds in different stages of development at the same time. Sexual reproduction also occurs. 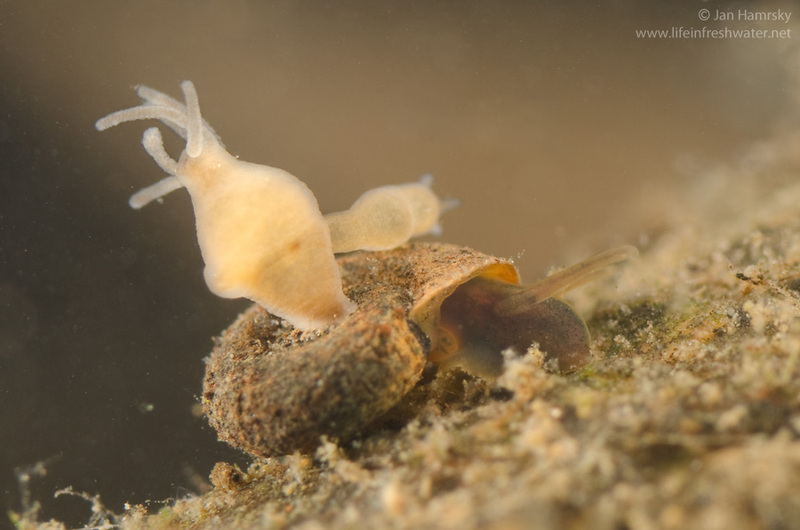 Some species have separate sexes, although most are hermaphroditic and produce both ovaries and testes. They release sperm into water to fertilize eggs of another hydra. 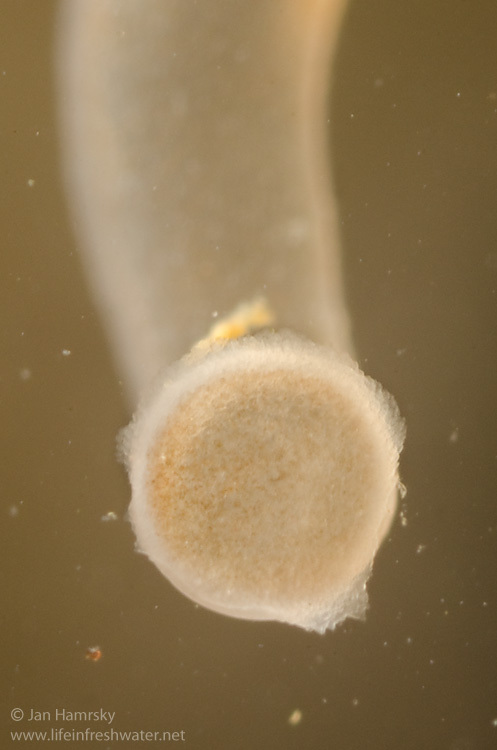 Fertilized eggs give rise to tiny planula larvae, which attach themselves and develop into polyps. Hydra do not show any signs of aging and appears to be immortal, which could lay foundations for the future medical research.